President Trump’s doctor confirms my diagnosis made in the story below, which was that the slurred speech (in the video above) was a classic sign of amphetamines and not Alzheimer’s. The doctor explained that he had been prescribing him pseudoephedrine for sinus matters. Pseudoephedrine is a powerful amphetamine that is also the source for crystal meth. During the campaign last year, President Trump exhibited erratic behavior during unscripted rally speeches. His sentences did not make sense. His hand gestures were exaggerated. His mouth was dry. I openly speculated that he was on amphetamines to lose weight. Fortunately, that behavior went away for most of this year. However, it has resurfaced. Yesterday, during a speech on Israel, the president had slurred speech and a very dry mouth. He could barely get through the teleprompter. 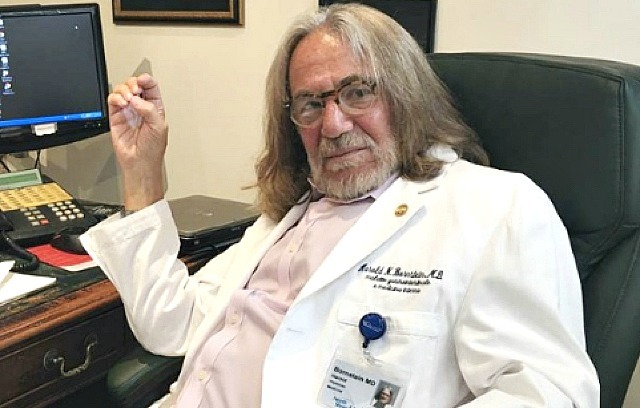 Today, I simply picked up the phone and called Harold Bornstein MD, President Trump’s personal doctor. He was easily reachable because he works from his own small office in Manhattan. He is not the typical of academic medicine luminary one would expect to be treating the president. I explained to Dr. Bornstein what I do. I said that I understood very well that he would not be able to speak to me about President Trump’s care at all. I proceeded to express my concern that President Trump is on amphetamines to lose weight. I was not asking him to reply at all. I was very professional, but he immediately became defensive. To make a long story short, I am quite confident that this flamboyant doctor has placed President Trump on amphetamines, either for weight loss or for a misdiagnosed case of ADHD. Doctors overprescribe ADHD pills quite commonly. I have written about this many times over the years. With the medical-sounding indication of “ADHD”, these pills seem like safe and effective treatments even for toddlers, rather than just new versions of the “Bennies” abused in the 50’s by Johnny Cash and Elvis. The pills certainly cannot have the same psychotic side effects as the amphetamines that Hitler injected himself with. Right? Wrong. I then mentioned to Dr. Bornstein that it would be easy to have the chefs at the White House simply change President trump’s diet. Shockingly, that simple concept did not seem to occur to him because he replied indignantly, “What?” Despite a news story this week about President Trump eating pure garbage from McDonald’s, changing the president’s diet is not a high priority. This is all so reminiscent of a variety of famous people throughout history who have had bad people surrounding them. Tiger Woods had numerous people around him enabling his pain pill addiction. Johnny Cash and Elvis were pumped up on amphetamines by members of their entourage. Michael Jackson and Howard Hughes had doctors available to them 24-hours a day. Recall, Jackson was killed by an infusion of Propofol given to him in his bedroom to make him sleep and the doctor was prosecuted. Hitler is probably the ultimate example of a powerful person being drugged by his inner circle. He was extremely addicted to amphetamines as he made more and more erratic decisions. Powerful people surround themselves with quack doctors all the time. There needs to be a full investigation into whether the President of the United States, who is preparing to go to war with North Korea, is under the influence of mind-altering medications. This entry was posted in - Opinion, - Pharma, - Policy, FDA, Internal Medicine, Neurology, Primary care medicine, Rehab. Bookmark the permalink.